I'm sure there are still going to be the whiners and complainers saying that Sidney Crosby is still not the same player he was or he's nowhere near where he should be this year, but his recent string of play has really turned the tide on his season and he's having a whale of a year. In Week Eighteen, he was the only one to post an 8-point week in the pool, which makes him our Player of the Week. In three games this week, Crosby finished with 5 goals and 3 assists, posting a hat-trick and an assist against the Senators on Tuesday, a goal against Tampa Bay on Friday and then a goal and 2 assists against Florida on Saturday. This brings up his season totals to 22 goals and 49 points in 50 games this year, which is nearly a point-per-game pace, and he now ranks 17th overall in pool scoring, 10th among all skaters in the league. No, it's not 1st overall... yes, he did have a slow start to the year... no, the Penguins are nearly as dominant these days, but the team has more working parts than just Crosby. Crosby was the 2nd overall pick in the draft this year, taken by Mike, but he hasn't quite been putting up the value that the 2nd overall pick would. Thanks to his slow start, he is now 27 points back of Patrick Kane, who is now ranked 2nd overall in pool scoring through the week and isn't likely to catch him before the end of the year. Still, he could get a good boost and move up sufficiently, where it doesn't look nearly as bad. The race at the top of the table is starting to heat up again thanks to a big week from the 2nd place team, as Jeremy posted a 37-point week, shrinking the overall lead back down to 3 points and with the Waiver Draft players going active today, it makes the race even more interesting, because Jeremy looked to make one improvement to his forwards in the week. 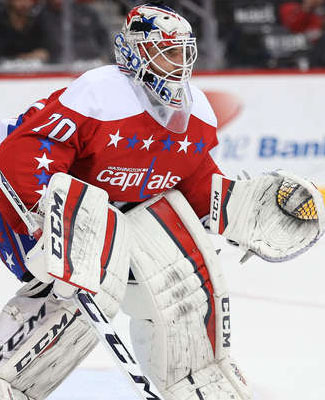 In Jeremy's first season in the pool, he has done a pretty good job putting this team together and it all starts at the back end again, where he has the current favourite for the Vezina Trophy, Braden Holtby, who led his team with 6 points in the week. If it wasn't for the All-Star shortened week, he would still likely be in the survivor pool, but his team was the last to fall, thus it has already ended. Also having a good week for Jeremy's team, Tomas Plekanec of the Habs, Mark Stone of the Senators and Kris Letang of the Penguins, each with 5 poitns in the week, which is a huge victory in itself. After those three, there were another three players with 3 points a piece and then there were a few 2-point and 1-point players and only a couple active players on his roster that failed to pick up points. In the second segment, which has now just ended, Jeremy's team finished 3rd in the segment, only behind Kristy & Don and Brenda & Seward in a pretty tight race. His 3rd place finish in the first segment was also fairly impressive and he will go into the third segment with a healthy squad and high expectations. He can thank a pretty healthy team this season, not to mention some good scoring rates, as his skaters rank 5th in the pool in games played, 11th in forward scoring rates, 9 in defensemen scoring rates, 11th in goalie minutes and 2nd in goalie scoring rates. It's a sum of the total though, fairly reasonable across the board. This is the first week in over a month that a team not belonging to a Stacey is in the Basement Dweller spot, as Cindy's team fell back to the bottom of the weekly scoring standings, for the first week since Week One, as her team only managed to rally together a 14-point week, in what was a pretty good week for scoring. This was the highest scoring dweller week since Week Two, when Mike had 15 points, so there is a small silver lining, I guess. Cindy's team had been doing some good things, leading up to Week Eighteen, as it finally got healthy and started climbing the ranks, but thanks to a poor week, dropped back down from 15th to 17th in the process. It is definitely still within range of doing some good things in the pool, but it's getting rather unlikely that her side will finish in the money. In the week, Tyler Seguin of the Stars was her team's top scorer, with 3 points in the week. At the other end of the spectrum, five of her players finished with 0 points, including both goalies, who haven't really paid much for dividends this season. Cindy opted to remain with the status quo through the Waiver Draft and will open Week Nineteen and the third segment 55 points out of the money. As mentioned in the Mover & Shaker portion, the race at the top has become a little bit more interesting as Brenda & Seward's team dropped a good portion of their 10-point lead over Jeremy, who made up 7 points last week. Still, it's a two-horse race at the moment, as John P., sitting in 3rd, lost ground on both teams, but did open up a little bit of space over 4th place, Neil, and 5th place, Stuart. Brenda & Seward were stationary through the Waiver Draft, Jeremy moved one forward, John P. passed his two picks, Stuart picked up a new forward and defenseman and Neil passed his two picks. How will this all shake out in the final nine weeks of the year? The return of Connor McDavid indeed ramped up the pace of Ryan's team in the rookie pool, as his team is now 50 points clear of Clayton's, more than double Clayton's overall totals. This pool was pretty much over at the drop of the puck at the beginning of the season, but it's not over until the final horn sounds. Clayton chose Mattias Janmark of the Stars, helping his team with his third rookie on it, but the pool itself is way too far out of reach, since he only picked up 43 points through two segments and there's only one left. The PIM pool isn't over until the final horn sounds too and at least this one has a little bit more play in it, despite the 50-minute lead that Wes has in the standings here. His closest competitor, Dale B., did drop a couple of PIM duds on his team, but I believe he was looking for a little more scoring in his replacements. That isn't to say they won't get more minutes, that's just not what they're there for. Derek & Dan didn't move to goon up too much in their Waiver Draft moves, rather they did try to improve their chances of not finishing last and at the same time, they did pick up Zack Kassian of the Oilers, who should be good for a few more minutes. John R., who moved back down to 27th in the standings, opted to goon it up in the Waiver Draft, but his team is 131 minutes behind Wes and is somewhat outclassed in the goon department. His best hope is to move into the top five and see what happens from there. I wouldn't normally expect the last week of a segment to be a record-setting week, but Week Eighteen saw the highest average scoring per NHL game this season, picking up 13.87 points per game in the week and we're only looking to improve on that after the Waiver Draft. That's kind of exciting. Skater games were up slightly and the goalie minutes were also up from a pretty poor All-Star week, both helping the cause. It wasn't a record-setting week in the penalty minutes, but it wasn't far off. 12.1 minutes per game ranks second to the All-Star week, so it's getting feisty out there now. With a lot of divisional games being queued up in the final weeks of the season, the fireworks will be going off for sure. It's a busy note day, as I skipped Sunday's posts, thanks to a harsh night of drinking. That was a lot of scotch. It was a return to the press box for Colin Miller of the Bruins on Saturday night, his first time in over a week. Boston has been running a solid rotation through the blueline and this Miller has found his way to the press box on numerous occasions. It's definitely hard on his numbers, that's for sure, but the it's the way it goes. Eric opted not to move out Miller at the Waiver Draft, not that there were many good replacements available. In 17 games since Week Ten, Miller is only good for 1 goal and 5 points, not to mention his 4 PIM. Things are not very rosy in Minnesota, as they have fallen well below the expectations set out for them at the beginning of the season and now the coaching staff has resorted to making statements in their roster as well. On Saturday, against the Blues, both Thomas Vanek and Jason Zucker were designated for the press box, which didn't necessarily help their cause, dropping that game, 4-1, but it did make a statement, that no one is safe. I would expect both back in the lineup soon, but will they improve on their 1-8-1 record in their last 10? Allan and Troy, respectively, had a little bit of a shock to their rosters, not getting that extra skater game before the end of the week and Zucker's performance this season has earned him a drop in the Waiver Draft, as Troy moved him out for a home run swing, Joseph Blandisi of the Devils. Talk about a less-than-rosy situation of late, it has been the Montreal Canadiens, although they managed to pick up a quick couple wins over the weekend, so it might be turning around a little. This isn't helping the cause of defenseman Nathan Beaulieu, as he was a healthy scratch for those two wins and when the team is winning, they are not likely to put players back into the lineup after being scratches. I would assume that Beaulieu continues to be a scratch for a while yet, unless the unforeseen happens. Of course, this won't help Cindy's team to try and get out of the Basement Dweller spot for the new week and since she stayed put on her team last week, that won't likely help either. Beaulieu was one of her Week Nine picks and since then, he has picked up 7 assists in 23 games. It was a nasty game between the Rangers and the Flyers on Saturday and that nastiness filtered through into a physical battle between Ryan McDonagh and Wayne Simmonds and it came to a head in the 3rd, when the two engaged in a ugly battle, which ended with Simmonds knocking out McDonagh with a solid punch to the head. The Rangers captain had to leave the game, while Simmonds was handed a match penalty for the punch. It was determined on Monday morning that McDonagh has suffered a concussion and will have to go through protocol, which will keep him out until Saturday, at the earliest. Derek W.'s team opens the third segment 42 points out of the money and could really use McDonagh's presence in the Rangers lineup to try and make some ground. Derek was busy, trying to improve his forwards during the Waiver Draft, so let's hope that it's enough to make up for this loss. On Saturday, Maple Leafs forward Tyler Bozak left the game against the Senators, after taking an elbow to the head/chin from Mika Zibanejad, but there is still no confirmation on the injury that he has suffered, although the Leafs recalled three forwards on Monday morning, which can't mean good things int he injury department. The Leafs are in Calgary on Tuesday night, so we should have an official update by then. More bad news for Allan in this post, as his team was doing some good things in that second segment as well. His team opens the third segment, only 1 point back of Derek W. above and if the Leafs are going to help his team turnaround, Bozak will have to be there.